The credit/mortgage crisis has been all the rage in the news lately. I thought I'd take a quick look at the real meaning behind all the facts and figures. To start with, let's look at the Census Bureau's American Community Survey for Los Angeles County from 2005. So what we're interested in here is the owner-occupied residences. How many of those have mortgages? Obviously the 23% of the people without mortgages can't default. So now let's look at the 77% of the homeowners that DO have mortgages. According to la-foreclosure.net, here are the number of foreclosures in LA county in the past 7 months. That doesn't seem like a huge number for a city the size of Los Angeles, but look at that as a percentage of the number of mortgages - 28,033 / 1,208,550 = 2.32% of all mortgages defaulted in only 7 months. When you think about it, that's a big deal. Mortgages are LONG term loans. It can take a homeowner 30 years to pay off a house. Annualized, that works out to a 4% default rate. Banks lose money on the houses that default. According to this blog (original article gone from the news website), the average foreclosure costs banks 20-25% of the loan value, or $60,000 nationwide. What would the loss be in California? The average California borrower took out a $436,749 mortgage during the first half of 2007, according to DataQuick Information Services -- just $19,749 over the conforming loan limit. Say we take the low end of that figure at 20%. That's a loss of $87,350 per default. From the same article, the average interest rate for a conforming loan with a good credit score and 20% down was 6.22%. How much will the bank make from these mortgages? According to this article, Washington Mutual is projected to have a net interest margin of 2.51% in the third quarter of 2007. The net interest margin is the difference between what they have to pay depositors for checking/savings/cd/money market accounts and what the rate they can lend the money out. Assuming that's the max you can afford to pay per month, what amount can you borrow if the rate goes up? Obviously, at a certain point this buyer drops out of the market because they are unable to find a house that is affordable. Supply probably drops as well, as people can't sell their homes because the value is lower than what they owe. Distressed sellers, who MUST sell due to financial hardship become more likely to default. This increases the default rate further, and results in even higher rates. Eventually it all shakes out and we reach an equillibrium point again. I believe this is probably about 3-4 years out. In the meantime, I would expect house values to stay about the same or possibly drop a little bit in real dollars and inflation adjusted, I expect them to drop by somewhere in the 10% range. I'm a big fan of David Allen's Getting Things Done (GTD) system. I think he's got a lot of great ideas that can make a difference in your life. Unfortunately, I've been struggling a bit with implementation. My problem is mostly the capture device. I just can't seem to find a tool that doesn't fail me in some annoying way. I started out with a Hipster PDA (hPDA). It has the advantage of being exceedingly cheap, easy to implement and light weight. For a week or two, I thought it was going to work out for me. Then I realized the fatal flaws: I'm a big guy and my body constantly is pouring off enormous amounts of heat. As a result, I sweat a lot, even in normal room temperature. Unprotected 3x5 cards in my pant pockets get ruined pretty quickly from the mildly damp environment. The cards lose their stiff cardboard quality, then become sort of soggy and unwriteable. The corners get bent. The edges get ruined. It's not as annoying in my shirt pocket, but only about 50% of my shirts have pockets. I decided I needed something to protect the cards. At first, I tried a cheapy buxton 3x5 holder from Staples for $10. After I cut off the annoying pen loops and removed most the extraneous garbage from the inside, I had something that worked. Sort of. The corners of the 3x5 were covered, and thus I only had a writing surface of about 2x4, which reduces the usefullness greatly. And it was on the wrong side (left) for a right hander. The next thing I tried was a moleskine. I started with a cahier. It worked alright, but the flismy cover and bendable quality quickly got on my nerves. I switched over to the full pocket notebook. It has a lot of advantages over the other systems; the full leather cover protects the paper, the bookmark, the rubber band to keep it closed. I organized the last chunk of the book into a datebook/calendar by putting one week per page. I put my open projects in the front of the book with an index. I used the middle portion for other data collection: maps to places I needed to go, phone numbers, email addresses, ideas, lists. It works pretty well. But I hesitate to write in it for some reason. I'm afraid to fill it with garbage, after I've invested so heavily in the format. It really is a top quality notebook though. Durable, good quality, easy to use. I still carry it with me, only I leave it in my car or at my desk. After nearly a year of drooling over the levenger shirt pocket briefcase, I finally decided that it was time to just bite the bullet and order one. $38 is a hefty chunk of change for a glorified piece of leather though, and the shipping from levenger isn't exactly cheap either ($9 for a $38 pocket briefcase by USPS, ouch.) I hesitated. I pawed through the catalog again and again. Then I did something I don't normally try - I tried eBay. It turns out that Levenger was unloading some outlet merchandise for CHEAP. I got a levenger pen pocket briefcase for only $19.40 shipped! (Normally $68 + shipping) Of course, it is monogrammed with some mistaken initials, but hey, I don't care and it's hardly visible. The Pen: I'm not a huge fan of it. In fact, I took it out and left it on my desk. It's got a strange square shape that takes getting used to, but the real killer is the fact that it's a ballpoint. After being spoiled with years of using Pilot Precise V rolling ball and Pilot Varsity fountain pens, I really can't go back. If it were a gel pen, I might be able to handle it. But not a simple ball point. It doesn't do well on 3x5's at all. I can't imagine paying the extra $30 for this feature, or $32 for the pen by itself. It's just not worth it. The Pen Holder Pocket: It fits the pen that comes with it just fine, although it seemed to try to slip out. Annoying. It also makes the whole thing sort of rigid and puts a bump on one side of the writing surface if you don't remove the pen. I tried putting a different pen in there. A precise V will fit, but just barely, and then you have to pull it out by the cap. I'm really not too impressed. I think it's far better without the pen at all. The Briefcase: It really is like a little briefcase. Has three pockets. You can tell by feel alone which one is which. I use the outside pocket with the lip indentation for my context oriented cards (@Home, @Work, etc), the center pocket for blank cards (which I've been carrying about 7 of), and the remaining pocket for used cards that have random thoughts and information on them. The leather is top quality, the stitching is perfect, everything about it is nice. It holds 3x5's very well without covering too much of the writing surface. The whole thing is nice and flexible, and it's hardly noticeable in the pocket. Overall: It's definitely worth owning. I'd say it's even worth the $38 plus $9 shipping. It takes the hipster PDA to the next level: Better organization, easier access, more protection for the cards from the harsh environment of the pocket. For a number of years, I commuted 30 miles each way, usually spending about 50 minutes doing so. It really took a toll on me, both financially and in draining my energy levels. A while back I moved to a 15 mile/25 minute commute and the difference was astonishing. Apparently, it has been a growing trend for people to commute really extreme distances. In this post, I'm going to take a look at the financial impact of the decision to work really far away from home. What is the Average Commute? There has been a lot of media attention in the last few years on the subject. I found an interesting poll conducted by ABC news that not only lists average commute time, but also distance. "Life for commuters can be heaven or hell. They report an average one-way commute time of 26 minutes (over an average distance of 16 miles). But the variance is huge: On the best days, the average commute is 19 minutes; on the worst days, 46 minutes. That means traffic, at its worst, can double the average commute time, adding 27 minutes each way." If the average American drives 12,000 miles a year, this means 4,000 miles are non-work related. 29.0 minutes getting to work. Assuming they are commuting the same distance as in the ABC poll, LA commuters are driving much slower at 33 mph. This is no big surprise if you've ever been to LA. Here's a story that defines what extreme commuting is in a few short sentences. Think your commute is tough? "3.4 million Americans who endure a daily "extreme commute" of 90 minutes or more each way to work. They're among the fastest-growing segment of commuters, according to a Census study, Journey to Work, released in March. Their commute times are more than triple the national average of 25.5 minutes each way." How many people are doing this extreme commute? The Census Burea says "Nationally, just 2.0 percent of workers faced extreme commutes to their jobs." But in Los Angeles, that number is much higher at 3.0% (PDF warning). Note that these numbers date back to 2003. With the effects of the housing price boom, I would expect significant growth to those numbers. Let's take those numbers of 90+ minutes and apply it to the average speed of 33 mph in the Los Angeles area. Plus an additional 4,000 miles a year for non-work related driving = 28,750 miles. 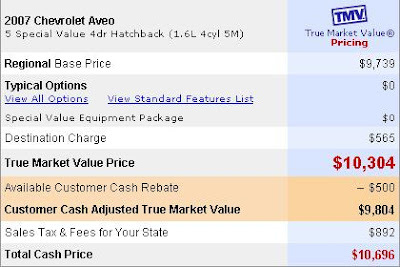 The absolute cheapest Edmunds.com TCO per mile I could find also belongs to the cheapest car in America - the Chevy Aveo special edition. Over a span of 15,000 miles per year over 5 years in Los Angeles, it supposedly will cost $0.44 per mile. Here's how they came up with their numbers. If this is for 15,000 miles per year, we need to modify these costs for our extreme commute of 28,750 miles per year. We'll assume that scales the same for the huge number of miles. The Aveo has a 100,000 mile powertrain warranty. If you do minimal repairs, Edmunds says that you on need to spend $774 over 75,000 miles. We'll up that to $2,500 to cover the period after the warranty runs out - but we'll assume major parts like the transmission and engine don't die until the end of the five year period. What would motivate someone to live so far away from work? Why not just move closer? Let's take a look at housing costs in two cities - Los Angeles, with lots of high paying jobs, and Palmdale, with cheap housing. I personally know of at least a few people that make this commute daily. The following information came with the calculator, and it looks to me to be a good wild guess at what they will cost. I used a down payment of $65,022 based on 20% of the cost of the house in Palmdale plus fees and closing costs. The calculator gives two results. Total, which includes all cash flowing out, and net, which includes the tax benefits of writing off interest/property taxes. So you require a far lower income to live in Palmdale. But then, there are less jobs and less money in Palmdale. So if you live there and commute to Los Angeles, do you end up ahead? Cost of the commute: $4,517.80 per year / 12 = 376.48 more a month. That advantage shrinks over time thanks to inflation. But so does the tax benefit of the larger interest payment on the house in Los Angeles. Will you have enough time for an extreme commute? If you work 9-5, that's 8 hours a day. Add 29 minutes to each end, and you have a 9 hour work day. Extreme commuting of 90 minutes x 2 adds another two hours to that, for an 11 hour work day. 8 hours of sleep plus another 1/2 hour to get up and get ready/eat = 19.5 hours. That leaves you with 4.5 hours a day to do other things. Not so bad, eh? Of course, how many Americans really work a 9-5? With a half hour for lunch, that's only 37.5 hours a week. According to the Bureau of Labor Statistics, in 2006 the average full time employed American worked 42.9 hours a week. Almost 10% of the people worked more than 60 hours a week and another 13.7% worked more than 49 hours. 9.1 hours a day + 3 hours commute + 8 hours sleeping + 0.5 hours getting ready = 20.6 hours = 3.4 hours a day to do other things. Now say you get in a traffic jam and it takes you an extra 1/2 hour each way. Now you only have 2 hours a day of free time. You can see pretty clearly that if you work extra hours or hit heavy traffic or drive more than 90 minutes, your free time can be quickly reduced to ZERO. Then you have to start cutting into other activities like sleeping in order to do other required activities like eating dinner, going to the grocery store, etc. I don't think it makes sense to commute much further than a half hour. If you can't afford to live within that distance, then you probably should move elsewhere, rent or find another job. Business Week had a similar conclusion. "This is what economists call "the commuting paradox." Most people travel long distances with the idea that they'll accept the burden for something better, be it a house, salary, or school. They presume the trade-off is worth the agony. But studies show that commuters are on average much less satisfied with their lives than noncommuters. A commuter who travels one hour, one way, would have to make 40% more than his current salary to be as fully satisfied with his life as a noncommuter, say economists Bruno S. Frey and Alois Stutzer of the University of Zurich's Institute for Empirical Research in Economics. People usually overestimate the value of the things they'll obtain by commuting -- more money, more material goods, more prestige -- and underestimate the benefit of what they are losing: social connections, hobbies, and health. "Commuting is a stress that doesn't pay off," says Stutzer." I always hear numbers thrown out about what you SHOULD be spending on various things. "1/3 of your income on housing." "$10 a day on food." But none of these systems are really comprehensive in guiding you for a budget. Wouldn't it be nice to know how you are doing compared to everyone else? Are you spending too much on your house? Did you buy a car that is more money than you can really handle? How much should you really be spending on clothes? It contains all sorts of data. What I was really interested in was the average percentages of expenditures of most consumers. Housing: 26% or about ONE QUARTER. This includes utilities, maintenance, mortgage, rent, etc. Transportation: 15% or about ONE SIXTH. This includes maintenance, the cost of the vehicle, gas, etc. Food: 10% or about ONE TENTH. This includes eating out and food made at home. I'm going to skip healthcare, because that varies based on age/location and health. So there you have it. A very basic rule of thumb for how much you SHOULD be spending if you want to be average. An interesting way to look at transportation is to use Edmunds.com True Cost To Own. For my Subaru Impreza, it's $0.52 per mile. $0.58 x 12,000 for a year is $6,960. Using the rule of thumb of 1/6, you reasonably need to make $41,760 to afford that vehicle. At least, on the average definition of "afford" over all consumers. Your household income is $24,000 a year. How much can you afford per mile for your car? $4000 / 12,000 = 33.3 cents per mile. Now obviously, these numbers don't add up to 100%. And it doesn't scale well to the high or low end of the income spectrum. But it gives you a general idea of what Joe average is spending, and it's a quick guide to start your own budget. Is it cheaper to bake your own bread or buy it at the store? For some reason, yesterday I got going on breadmachines. 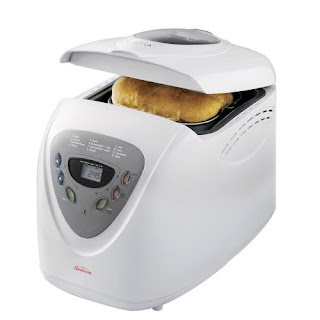 Amazon.com has a pretty nifty Sunbeam 5891 automatic bread maker for $42.24 (with free shipping!) I got to thinking, gee whiz - how much does bread really cost to make? I hardly know ANYONE that makes their own bread anymore. So I went looking. I found the simplest possible bread recipe using hardly any expensive components like dried milk, butter, etc. This simple recipe can easily be modified to suit your taste. I figure it can't get much less complicated than that, right? Then you have the cost of electricity and the wear and tear on the equipment. Since it has a one year warranty, I figure it could be used 365 times. $42.24 / 365 = $0.1157. The machine peaks at 600 watts and it takes three hours to bake. Figuring at $0.10 per kilowatt hours, that's 1.8 kilowatt hours or $0.18. At the very same store, they had a loaf of "value" bread for $0.89 with 22 slices at 120 calories per 2 slices. 11 x 120 = 1320 calories, or 1483.15 calories per dollar. Much cheaper. "But wait!" you say. "What if I just used the oven instead?" Well, I believe an electric oven OR a gas oven would cost more to operate than the bread machine. This site says it costs $0.20 per hour to operate an electric oven and $0.18 per hour to operate a gas oven. Even if the oven lasts 20 years, it costs $350 for a cheap one, or 4.8 cents per day. You would also need a bread pan, and more tools to make the bread since you would have to mix it yourself. Which may slightly edge out the breadmaker at $0.2957 per use, but ONLY over the very long term. This also ignores the connection fee that might actually make gas more expensive than an electric oven. So assuming the breadmaker is the most efficient way, how can you reduce the costs further? 1) Make your own yeast. It's easy if you like sourdough bread. Instructions. This would save $0.6122 per loaf. 2) Buy the flour in huge bulk at a warehouse store. I'm sure it's much cheaper than $0.1972 per cup if you buy a 50lb bag at costco. But where do you store it? 3) Buy the salt and sugar in huge bulk. Actually, since it's in a 5 lb bag already, you have a 153 day supply of sugar. The salt is expensive "real salt" which I'm sure you can completely crush if you bought a big bag of generic salt somewhere. Or 2,109 calories per dollar. I suppose, given your willingness to work harder and make more of the components, bread CAN be cheaper than store bought. But just barely. It's pretty damned hard to compete at home with the giant production line and enormous buying power of a large bakery. Better bread typically runs $2.29 per loaf. The problem here is that in order to make a similar product at home, you need far more components like honey, dried milk, butter, etc - which are very expensive. Unless you want to make a very specialized recipe that you can't buy at the store, it makes more sense to just buy the bakery made bread. Prosper.com: Debt to Income (DTI) shenanigans. I've been wondering what would drive a person to Peer-To-Peer (P2P) lending. Why would anyone want to take out a loan from a website like Prosper.com when it seems like every day the huge banks are trying desperately to loan you money in one form or another. The bank I chose for comparison was Bank of America Corporation (BAC) one of the largest banks on earth. 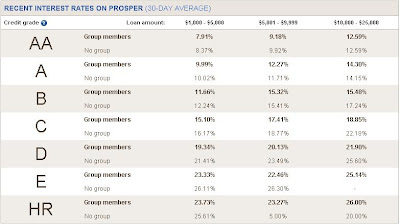 I found some data on their loan rates in this Supplemental Second Quarter 2007 Financial Information on page 9, titled "Quarterly Average Balances and Interest Rates - Fully Taxable-equivalent Basis"
Now let's look at Prosper.com. They have a nifty chart of loans made in the past 30 days, but I didn't think it was all that helpful as it didn't tell you amounts or give you an idea of weighted rates for comparison to Bank of America. Here it is anyhow, for your amusement. Instead, I found the following data on their loan performance page for June 30, 2006 - June 30, 2007. Then I thought it would be interesting to look at recent activity, so I pulled the data for June 1, 2007 - June 30, 2007 and ran a few numbers. Using the above average returns and assuming that 100% of the HR loans will default (0% return), I got a weighted average APR of 10.19%. Compare this to Bank of America's average rate for a direct consumer loan of 8.46%. That's a premium of 1.73% over Bank of America's average return. What's the deal here? Why would you pay a premium to throw your life story on the internet where anyone can read it? Is it because the borrowers have low quality credit? And to be helpful with your analysis, Prosper.com also provides you with this nifty chart of historical defaults by credit grade. Please not something VERY important on this chart - the note that says "for borrowers with debt to income ratios of 20% or less". Going back to the loan data from June 2007, it appears that most of the loans are being made to high quality credit. 48.2% are going to A or beter, which are people with credit ratings of 720+. That should be a default rate of less than 0.9%, right? WRONG. Let's look at what Prosper has to say about DTI. "What is a debt-to-income ratio? Part of a borrower's credit profile is a debt-to-income ratio. Debt-to-income ratio (or DTI) is a measurement of the borrower's ability to take on additional debt. This number takes into consideration how much debt the borrower had prior to their loan in addition to what their debt will be if the loan they are requesting is made. (Their debt history is part of their credit history, and is reported to Prosper in the initial credit check.) The DTI is calculated by dividing the borrower's annual income (before taxes) into their annual non-housing debt payments. It is expressed as a percentage. Generally a DTI of 20% is at the upper end of normal when excluding housing debt. Loans with debt-to-income ratios exceeding 20% are more risky—in some cases very risky—and much more difficult when trying to estimate default risk. In fact, whereas Prosper provides general default rate estimates when debt-to-income is 20% or lower, no estimates are provided for debt-to-income ratios greater than 20%. If the DTI is shown as "N/A" (not available), it may be for one of two reasons. First, it may be that Experian (Prosper's credit reporting partner) has not been able to provide a reliable number for the borrower's monthly debt burder. Second, it may be that the borrower cannot provide documented proof of income, and has stated so in his or her application. If you are a beginning lender or unsure of how to factor in high-risk borrowers, we recommend that you stick with borrowers who have a DTI of 20% or less." So MOST of these loans are being made to people that are listing their DTI at ABOVE 20%. No wonder the big banks won't give these people money. According to the the US Census, renters spent 29% of their income on housing in 2001. So say 20% is the upper guideline for DTI. 20% DTI + 29% housing = 49%. That leaves 51% for food, transportation, savings, luxury items, insurance, etc. It seems pretty iffy. Now look at the C grade debt at 37.08% DTI. 37.08% + 29.00% = 66.08%, leaving 33.92% for food, clothing, utilities, etc. At under 20% DTI, the C default rate is 3.30%. What do you think the default rate is above 35%? But it gets worse - I believe their listed DTI ratios are questionable at best. I want to stop my collection accounts from accruing more interest by making a settlement on the larger one, and paying in full the smaller one. As you see in my listing, my total delinquent amount is about 3600. The larger account is 3300 of that total. I recently received a settlement offer of 1300$ for that account. I used to work in the debt collection industry for Northland Group (about 1 yr) and FRS (Financial Recovery Systems, about 6 months) and I know that summer time is the hardest time for them, so I'm writing a counter offer of $700. I'm sending my correspondence by certified mail, and only accepting an offer if I receive it in writing. If they do not accept my smaller offer I will immediately make another offer slightly higher until I come to an agreement with them. I know they will NEVER offer me in writing the lowest they can accept. That's taking money out of their own pocket. I'm asking for the SMALLEST amount of a loan that I can because I don't like to borrow money anymore, but I know now is the right time to try to get my deal accepted by the collector. That's why I am asking here. I have around $500 in savings in a sharebuilder account, as well as some old series E savings bonds which were given to me by my grandparents as a gift, which now are valued at around $350.00. I would not want to cash them in unless I had to, but the sharebuilder account is my emergency fund. Other expenses: $ 65.00 (cell phone)"
I think something might be askew in the numbers, don't you? Theoretically, he SHOULD have $655 a month of free cash, right? Obviously he doesn't, or he wouldn't be borrowing money to pay off $3600 in defaulted credit cards. For example, I strongly question the food expense of $100. Food stamps are $155 a month for a single individual and that's supposedly hardly adequate. Yet somehow he's able to live on $3.29 a day? More importantly, he lists a DTI of 2%. Even if he only needs to pay $30 a month towards the two cards - what about the cell phone? Isn't that an open account at $65 a month? What about the phone line? The internet? The cable? Something isn't right here. While it's a lovely idea to want to help people with their problems AND make money doing it - clearly there is a reason that these people have to go to Prosper.com to get the loans. They are already loaded to the gills with debt and shouldn't get anymore. Further, since you can't possibly predict the actual default risk - since the information is flawed at best, you can't figure out what your required return needs to be.